The generator is a device which converts the mechanical energy into electrical energy. In order to understand the operation of a simple generator, consider rectangular coil ABCD placed in a magnetic field as shown in the figure. The two ends of the coil are connected to the two copper half rings (or split rings) R1 and R2 called commutator. There are two carbon brushes B1 and B2 which press lightly against the two half rings. The generator works on the principle of electromagnetic induction proposed by Faraday’s law. According to this principle, “An emf is induced in a conductor whenever there is a relative motion between a conductor and a magnetic field”. Let us suppose that the generator coil ABCD is initially in the horizontal position. As the coil rotates in the anticlockwise direction between the pole N and S of the magnet the side AB of the coil moves down cutting the magnetic lines of force near the N-pole of the magnet and side DC moves up, cutting the lines of force near the S-pole of the magnet. Due to this, induced current is produced in the sides AB and DC of the coil. 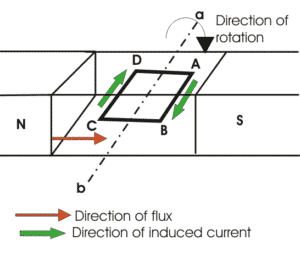 On applying Fleming’s right-hand rule to the sides AB and DC of the coil we find that the currents in them are in the directions B to A and D to C respectively. 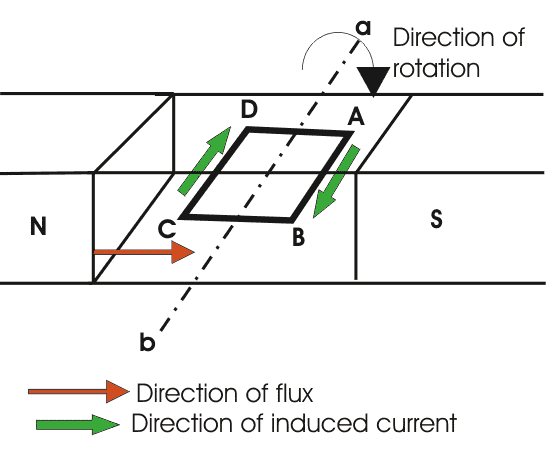 Thus the induced currents in the two sides of the coil are in the same direction and we get an effective induced current in the direction BADC. Due to this the brush B1 becomes the positive pole and brush B2 becomes the negative pole of the generator. After half revolution, the sides AB and DC of the coil will interchange their positions. The side AB will come on the right-hand side and starts moving up whereas side DC will come on the left-hand side and start moving down. But when sides of the coil interchange their positions, then the two commutator half rings R1 and R2 automatically change their contacts from one carbon brush to the other. Due to this change, the current keeps flowing in the same direction. Thus a DC generator supplies a current only in one direction.